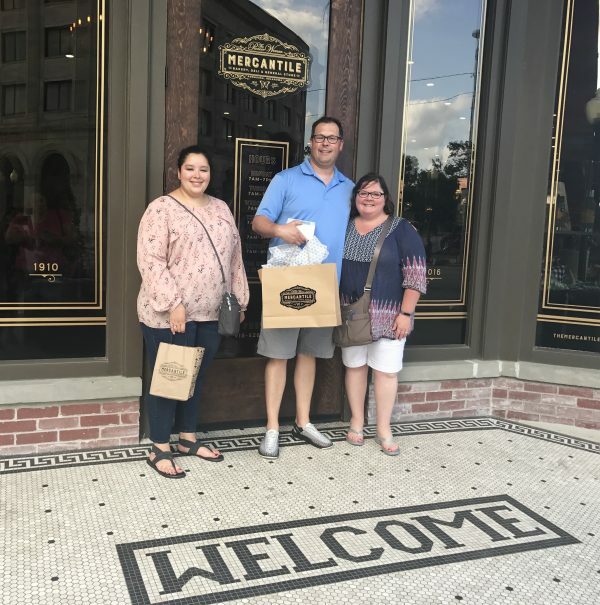 About 12 hours after Steve finished his last school board meeting and his ended his career as a middle school principal, we were on the road for a much-needed (and anticipated) vacation. 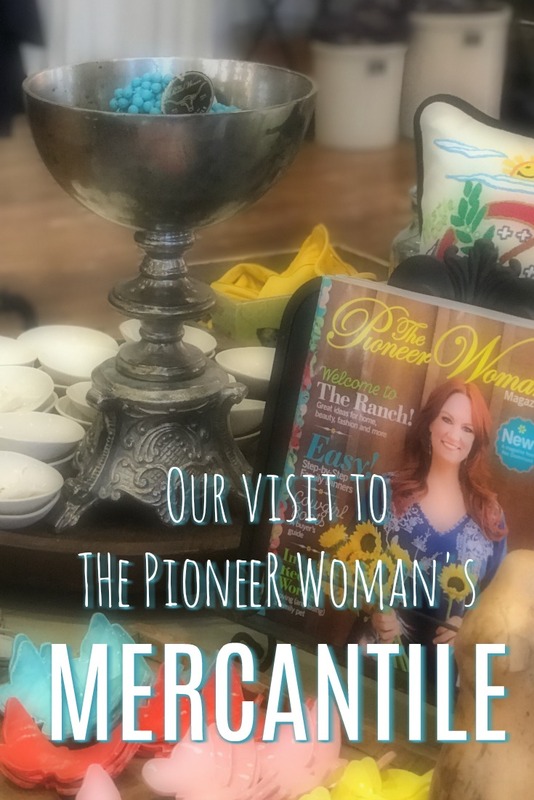 First stop – Pawhuska, Oklahoma to visit The Pioneer Woman Ree Drummond’s Mercantile. 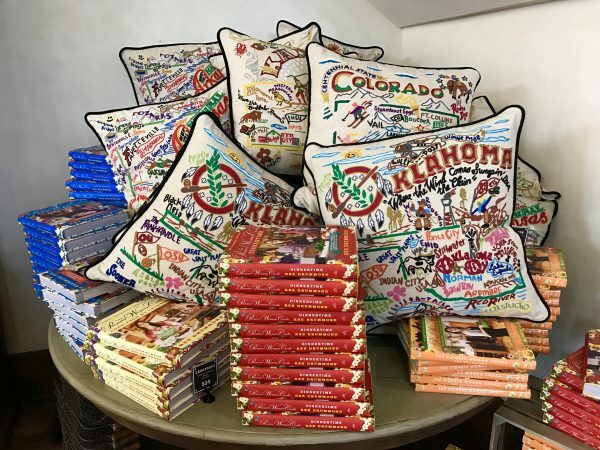 Once a booming oil town with claim to having organized the first Boy Scout troop in America, Pawhuska went decades with little notice after the Great Depression. 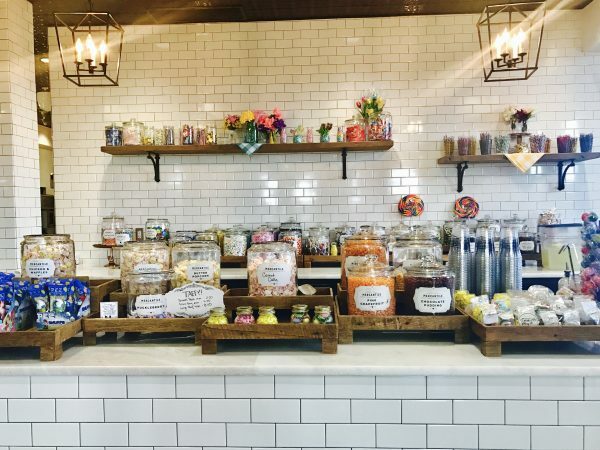 Then, Ree Drummond, a self-proclaimed pioneer woman, desperate ranch wife, mother of four, and lover of butter brought this small town back into the national spotlight. 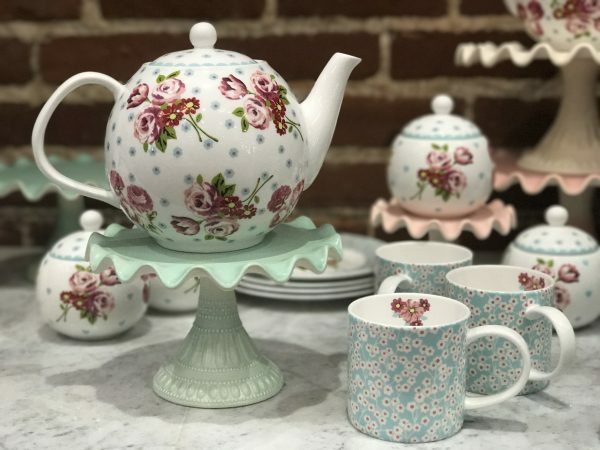 Creator of the weblog, The Pioneer Woman, and star of the self-titled Food Network cooking show, Ree has filled the hearts of her readers and fans for years. 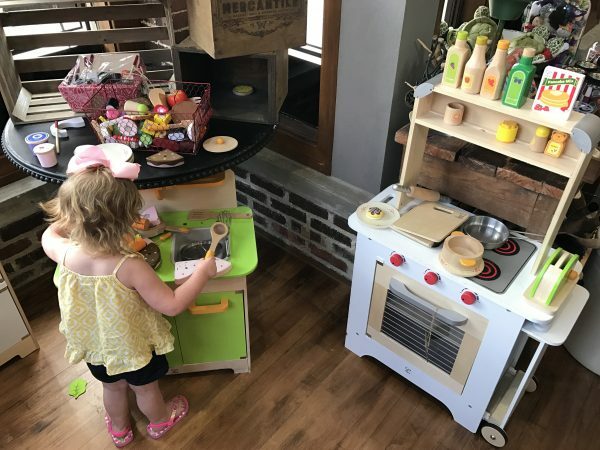 Now, she’s filling their stomachs, as well, right in downtown Pawhuska. 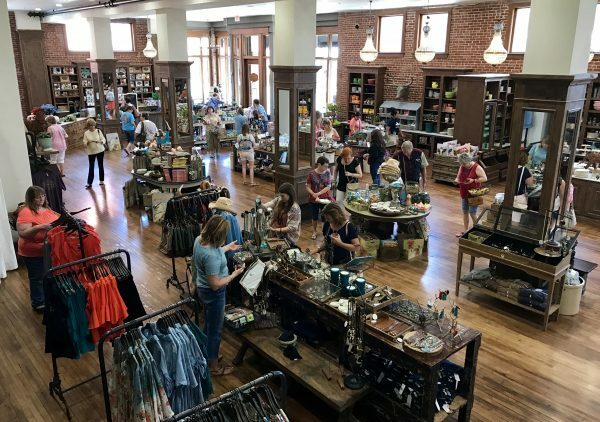 The Pioneer Woman Mercantile in Pawhuska, Oklahoma. We drove from our home in southeast Nebraska to The Pioneer Woman Mercantile in a day, arriving just in time for an early supper. 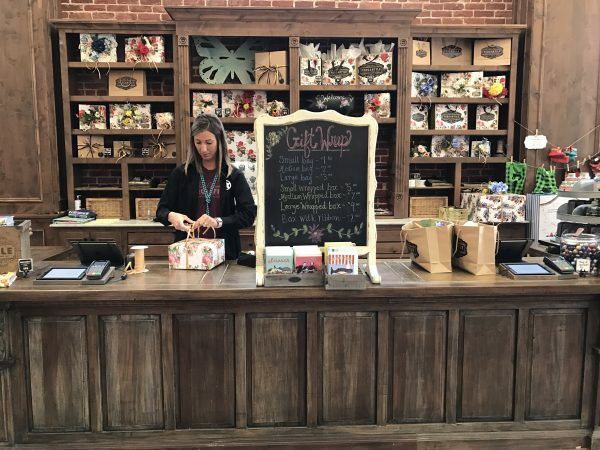 A Mercantile staff member greeted us as we walked up and opened the door for visitors. 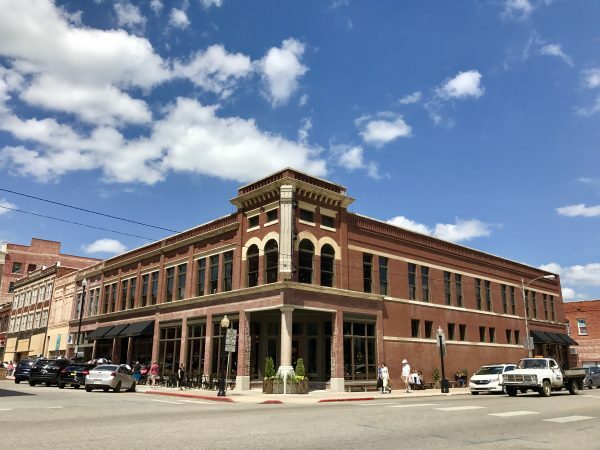 Small town hospitality is at its best in Pawhuska. Hoping to get a table in the deli, we got in a line that extended down the block and were told we should be seated in less than two hours. 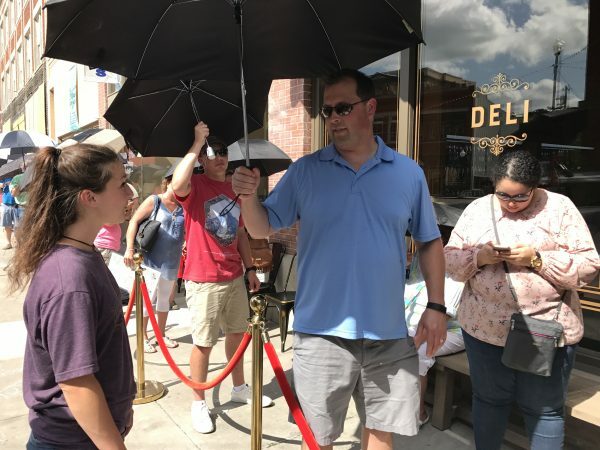 Fortunately, I have the most selfless husband who said he was more than happy willing to stand in line in the hot sun while Meghan and I went inside to explore the air-conditioned general store. I wasn’t going to pass up that opportunity and ventured inside The Merc, as Ree often calls it. 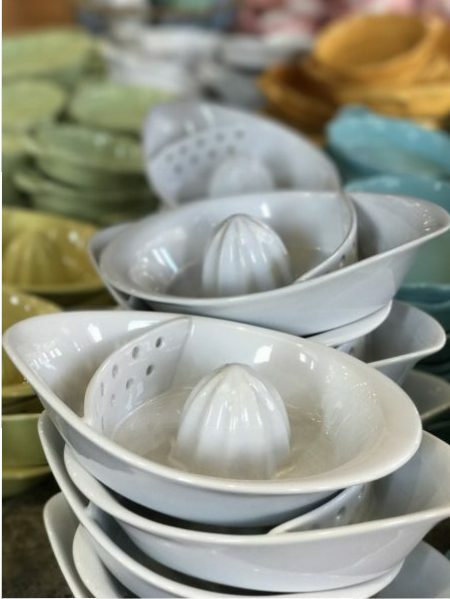 By late in the day, the general store wasn’t too crowded and we were able to browse the wooden shelves, admiring the brightly colored juicers, nut bowls, and ramekins. I loved these colorful juicers. 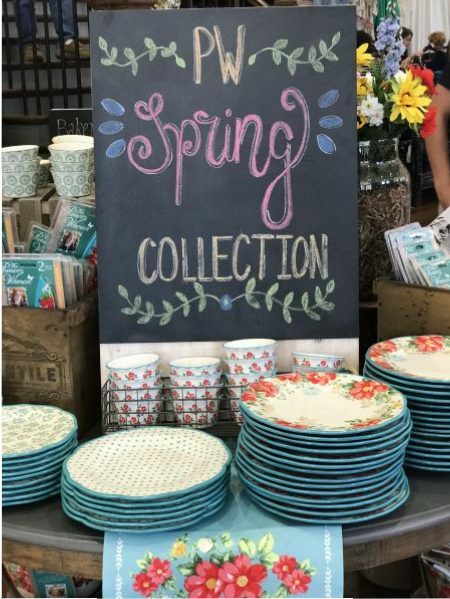 We strolled past stacks of Pioneer Woman glassware and dishes and checked out fancy dispensers for common kitchen necessities like plastic wrap and parchment paper. The Merc had everything. 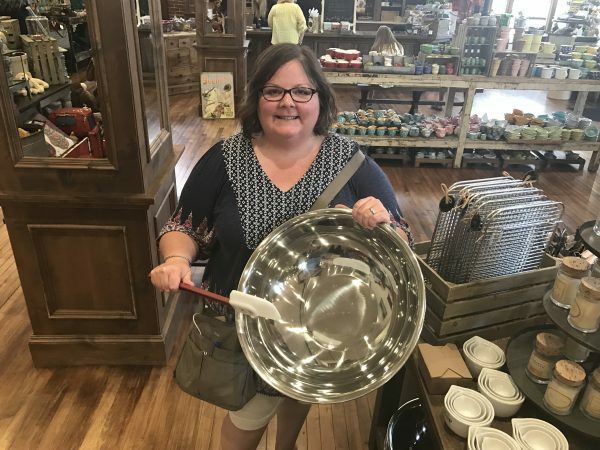 Stainless steel mixing bowls in every size imaginable, cast iron skillets like the ones Ree cooks with on her show, and so many pretty cake plates and teapots. 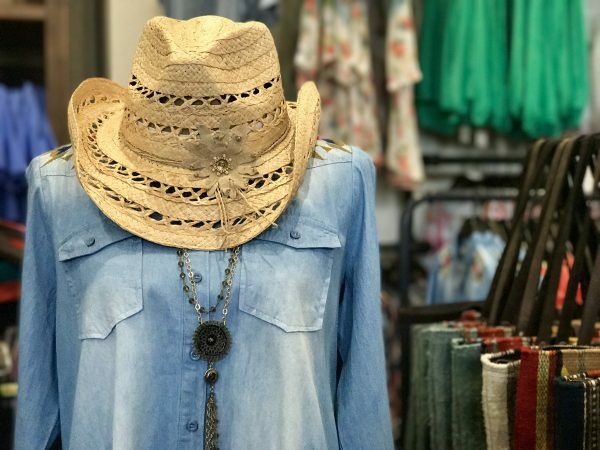 There was even a small clothing and jewelry section, complete with the colorful tunics Ree has made so popular, and her signature leather bracelets and turquoise-colored beads. 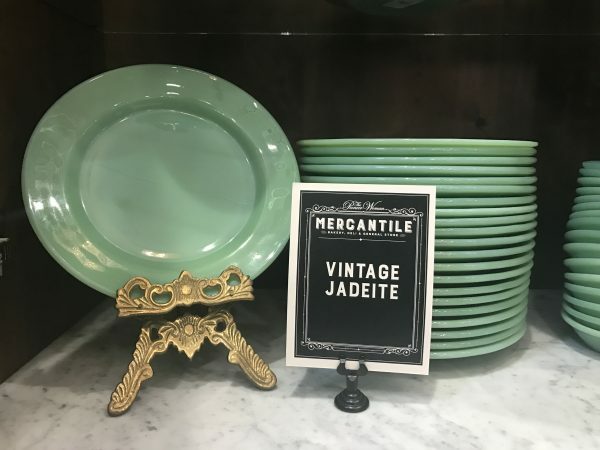 The perfectly organized merchandise was beautiful, but even more eye-catching was the amazing renovation of the building that had been a mercantile way back when. 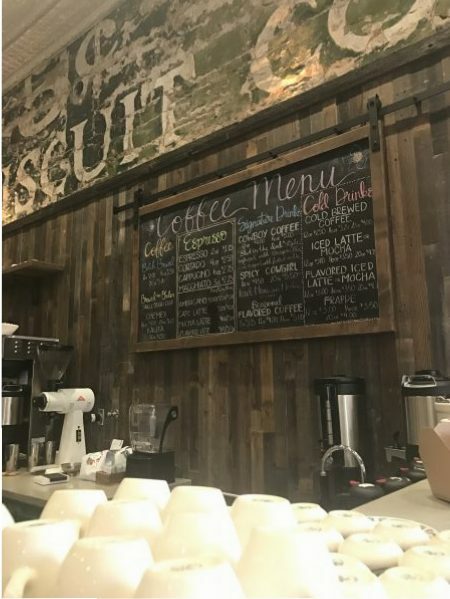 This mural from the National Biscuit Company was uncovered during renovations. 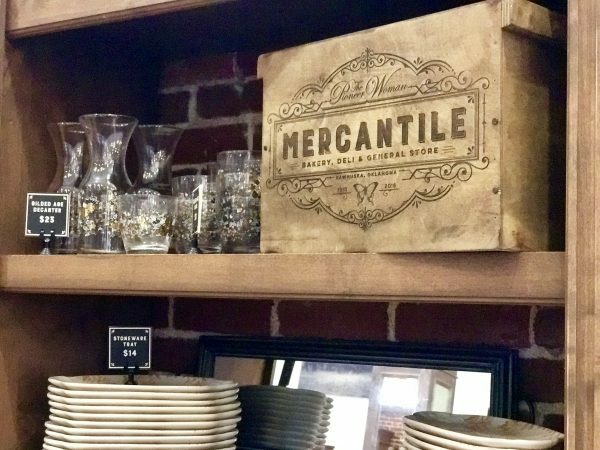 Just like an old mercantile, items were tucked away in drawers. Original brick, wood, and an uncovered mural highlighted the structure and the Drummonds’ attention to detail was impeccable. 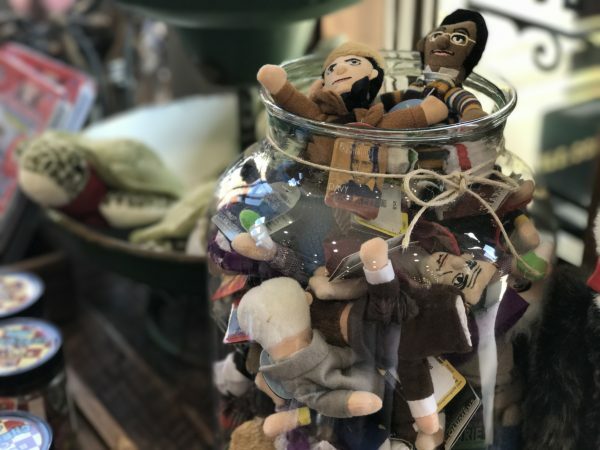 There was a gorgeous gift wrapping counter in the back of the store and a darling little children’s corner with a play kitchen area to keep children entertained and lots of jars of finger puppets of historical figures. The gift wrap was just beautiful. 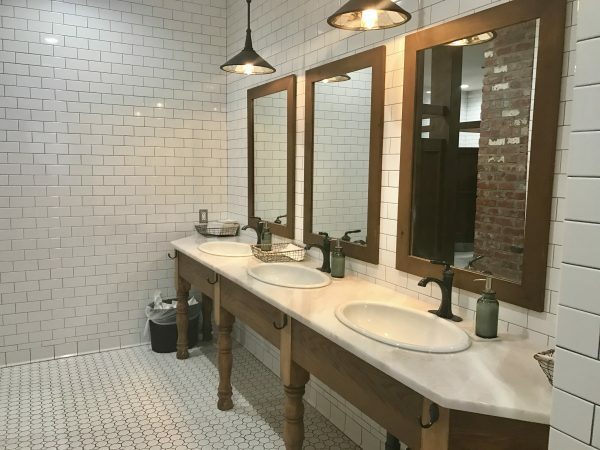 I wouldn’t typically blog about stops at the ladies room, but I have to say, this one was worth noting – and yes, I took pictures. The bathroom was beautifully designed. It included hooks to hold your bag while you wash you hands, and would you believe it, was stocked with Charmin toilet paper (don’t you just love details). After I was finished using the restroom had taken enough pictures, I wandered up the winding staircase to the second floor. At the top of the staircase was large room full of natural light from the floor-to-ceiling windows. 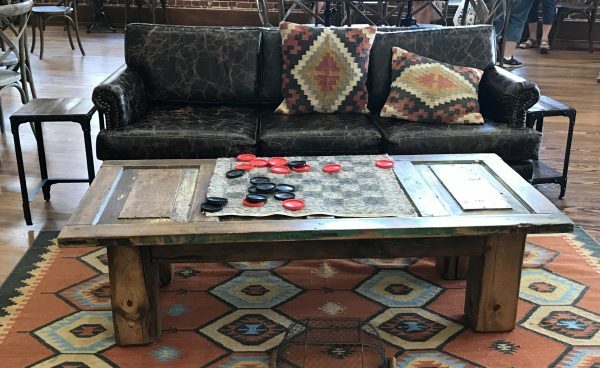 It was furnished with comfy couches and wooden tables that made it a perfect place to sip coffee and shoot the breeze. At the far end were a coffee bar, bakery and candy shop. 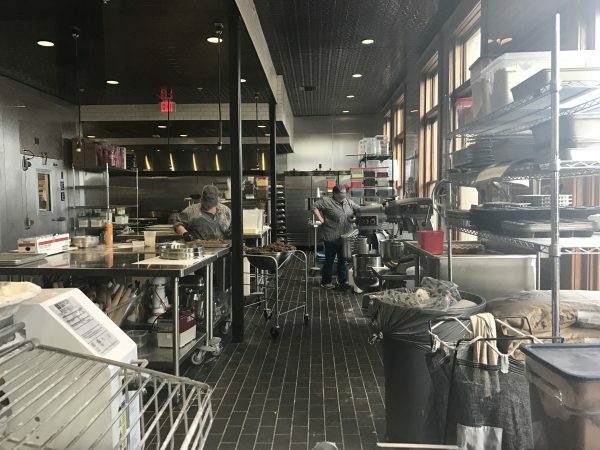 And down a short hallway, you could actually peek in through glass windows at the kitchen staff preparing sticky rolls, cupcakes and maple scones in mass – and I mean mass – quantities. We decided that we’d hold off on trying the baked treats until the next day and instead browsed the store a bit more, checking in on Steve every so often and giving him bathroom breaks. I stuck to our pre-established budget and made it out with a few gifts for our moms, an extra-long spatula, a white colander, and one of those fancy parchment paper holders. By that time, Steve had made it to the front of the line and we were ready to taste Ree’s creations in the deli. Coming soon: Yes, the food is as good as it looks on TV; our visit to The Lodge; and Steve’s advice for men at The Merc. We were in Pawhuska at the Merc on Saturday, Oct. 7. Steve: I believe you took a pic of my husband, Rick, and another gentleman sitting on a bench with shopping baskets in their laps. You gave Rick your postcardjar.com card and stated that to keep looking on your website for a picture of the guys. I haven’t seen the picture yet. Is it forthcoming? Advise and thanks. Loved the National Indian Taco Championship festival that day. Enjoyed the Native American dance demonstrations; vendors, and tacos. 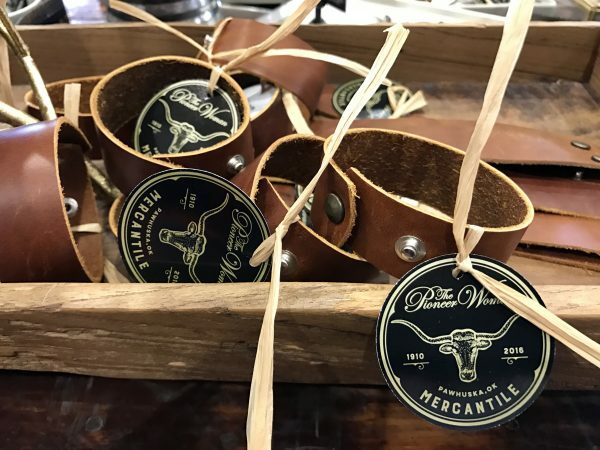 We visited the Swinging Bridge; drove out to the Tallgrass Prairie Preserve and saw bison; found the actor Ben Johnson’s gravesite and of course, spent plenty of time at Pioneer Woman’s Mercantile, Bakery and Deli. Our dinner that evening was well worth standing in line for an hour and a half. It’s fun to talk to people while standing in line — from all over the country. I’d love to go back to Pawhuska and do a Lodge tour. Great to hear from you, Sharon! We are just working on our Pawhuska posts today. We will have a few new blog posts about our adventures there this week, so please stay tuned. And yes, we’re using the picture of your husband, if that’s still ok! We enjoyed our time in Pawhuska as well. I hope you’ll get back for a Lodge tour sometime soon. Yes it’s OK. Can’t wait to see the picture! Thanks Ann. Enjoy hearing about your travels. Take care. Yes it’s perfectly fine. Can’t wait to see the pic. Thanks Ann. OhmygoodnessitwaseverythingyousaidandMORE!!! Hi– yesterday was the day… just before noon on a Saturday. Can i pick em?? I came into Pawhuska from the west, wondering if i would find The Merc without asking for directions. A half second later, came upon the busiest intersection this side of, well, it was filled with people. 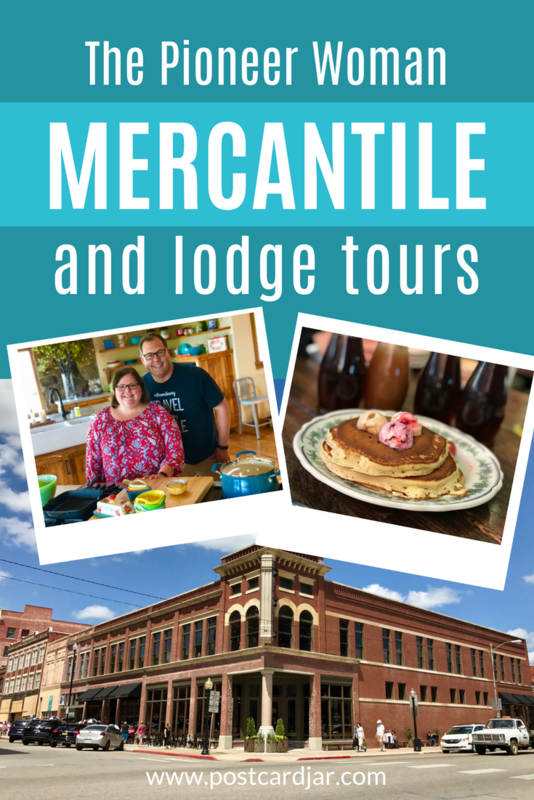 And there was The Mercantile on the corner looking just wonderful in this little town. There were streams of (mostly) ladies slowly walking away with most carrying at least one bag with the distinctive store logo on the sides. Those folks headed toward The Merc moved more sprightly and i soon joined them. Inside – wow! 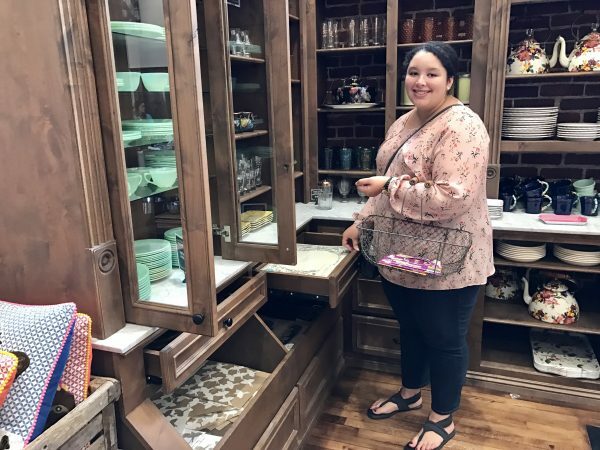 I grabbed my wire egg basket at the door and headed in to shop, knowing the wait for sit-down food was beyond me– that will be my next visit! I snapped up lots of special goodies, including a cast iron bison 🙂 which was gift wrapped so i can open my birthday present later and, of course, save the paper and flower decorations! Finished upstairs thanks to your blogging, with a box lunch (ham & swiss) and my bday “cake” was a warmed pineapple upside down corn cake. 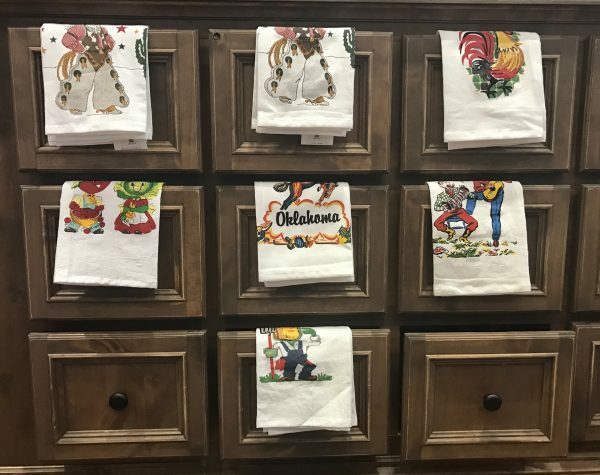 (btw the upstairs restrooms just as gorgeous as downstairs) Sat a while watching shoppers and looking around, then retraced my steps to the car.. and on to OKC for the Garth Brooks – Trisha Yearwood concert with Mitch Rossell opening for them. What a fun (and expensive) day. I would never have ventured to The Merc if not for You Three!! Thanks SOOOO much! 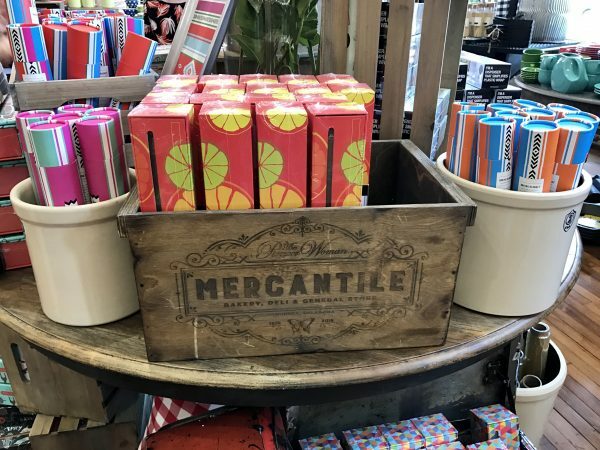 We are so glad you enjoyed our blog post and your visit to The Pioneer Woman Mercantile! This was so fun to read! Can’t wait for the next part. We are on a cruise right now with limited internet. We will post when we are back. Thanks for following along! Be sure to subscribe to our email list so you are kept up-to-date.